yeah…. that’s just about it, you just invest which business that you’d like… actually at the end you just click anything that you could put your money on. 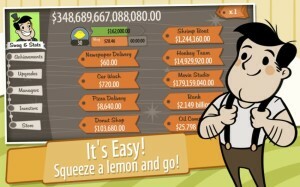 The amount of money are illogical i think, on my android my lemonade stand generate $35.243 quattuorquadragin per second, yup it’s a lot of money for a lemonade stand. Because the nature of my position as an investor i dont need to give a damn about the chain of production of a lemonade stand, i just get the income information per second. If my income seems to stuck for a long time, i just sell all of my business in exchange of angels that generate interest… yes, sell all of it, i dont need to bother with the severance, labour union, government etc. Just restart the business with a silver spoon. – how much your blog worth? Previous PostAfter almost five years working exclusively with laptop…Next PostLearn the Architecture.